If you do a clean install with the Media Creation Tool, it defaults to Windows 10 Home instead of offering Pro, even with a valid Pro or Enterprise key. If your computer originally came pre-installed with consumer editions of Windows 7 Home Basic/Premium or Windows 8/8.1 Core or Single Language, you might want to perform a clean install to Windows 10 Pro or Enterprise. Unfortunately, the installer created from the Media Creation Tool will default to Windows 10 Home instead of offering the choice of either Home or Pro, even if you use a valid Pro or Enterprise key. 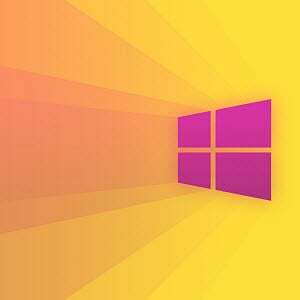 On systems that came preinstalled with Windows 8, Microsoft introduced a new mechanism for product activation. Instead of using the old OEM SLP (System Lock Protection) key method, which allowed major brands such as Dell, HP, and Lenovo to install Windows in bulk, a unique product key is embedded in the firmware of the computer. This also removed the need of the Certificate of Authenticity stickers you would see attached to a PC running Windows 7 or earlier versions. Microsoft describes the behavior as by design, but it’s an extra bit of chore and confusion when setup is complete. Here is how you can work around the issue. 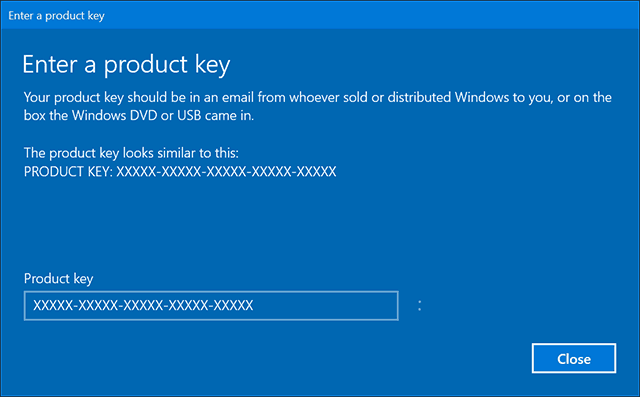 The Windows 10 November Update introduces the ability to use your Windows 7 or Windows 8 product key to activate the operating system. The problem is if you have Windows 10 Home installed, a Windows 7 Professional, Ultimate or Windows 8 Pro product key will not be recognized as a valid even with the Easy Upgrade wizard. What you will have to do instead is use the default Windows 10 Pro product key to upgrade to Windows 10 Pro. Enter the following key: VK7JG-NPHTM-C97JM-9MPGT-3V66T. Note: Don’t worry, this a publicly known key used for diagnostic purposes. 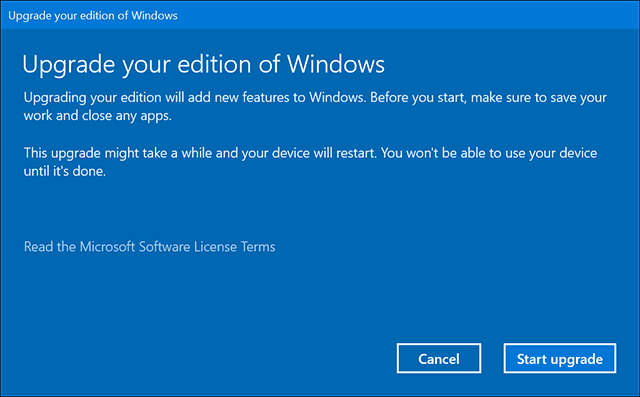 No, it will not activate Windows 10 Pro installations for free. Wait while the upgrade takes place. Your computer will restart a couple of times. After that, you can then use your valid Windows 7 Professional/Ultimate or Windows 8 Pro product key to activate Windows 10 Pro. You should now have Windows 10 Pro up and running successfully. This process a bit convoluted, but it does work out in the end. Hopefully, Microsoft releases a fix to this in 2016. This article doesn’t really answer the question at hand. How do we switch the installer from selecting Home edition when what we want to put there is Pro? The latest windows 10 installer we can create with the Media Creation Tool does not make a distinction between Home or Pro versions, only between 32 or 64 bits and it can include both. How do we tell the installer WHICH version we want to install if it automatically defaults to the one the system automatically qualifies for? We never get that question, the installer “assumes” Home for Home and Pro for Pro. “What you will have to do instead is use the default Windows 10 Pro product key to upgrade to Windows 10 Pro” We will never get this question. If we run the installer on top of a Home edition, it will try to re-install Home and won’t ask any questions and won’t prompt for any keys. Unfortunately, on systems using OEM Activation 3.0, it is not possible to do so. Once the installer detects OA3, it will automatically default to the logical edition the machine is licensed for. So if your machine came with Windows 8 Pro, you will get Windows 10 Pro by default, if its Windows 8 Core or SL, you will get Windows 10 Home. Thats why I hope they fix it in the future although officials from the company are saying it is by design and it is doing what it is intended to do. At least the work around does not require you to start from scratch. After following the described steps, will the system now install Win 10 Pro by default at the next clean install, or do I need to follew these steps again? Just the same as performing a clean install using media. Thank you so much for publishing this! I just reinstalled a laptop that had 8 Home as the firmware key and I had previously upgraded it to 8 Pro and then 10 Pro. When I reloaded Win10 I saw it installed Home and it would not accept my upgrade key to change it to 10 Pro. This worked perfectly! I didn’t even have to put my new key in again after putting the temporary 10 key in. I guess it recognized the hardware as valid for activation of 10 Pro since I’d previously done it. Been searching all over and thought I was going to have to call Microsoft to straighten this out. Thanks again! I used that product key to fix a fresh reinstall of Win 10 Pro on a PC that had a Win 8 Home key in the BIOS so it installed Win 10 Home automatically without giving me an option to choose. 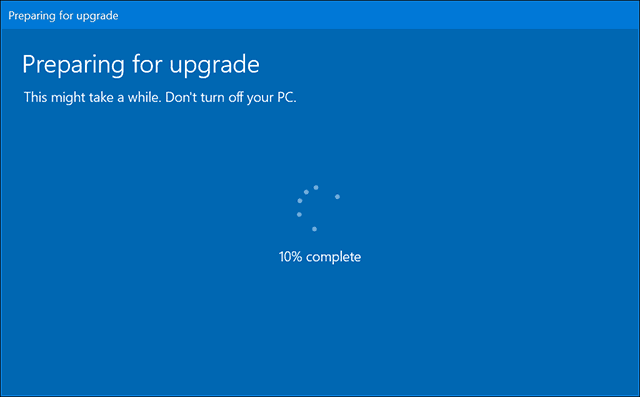 The PC had been previously upgraded to Win 8.1 Pro and then Win 10 Pro so it was already activated and using the diagnostic key allowed me to upgrade it to Pro successfully. Will this method work after the July 29th deadline? On new installs, or only on keys that are registered to have activated a Windows 10 Pro installation, or neither? Thank you for the article. Helped me out greatly after doing a clean install with the Anniversary Update. Couldn’t figure out how to get the PRO version I had installed again. After installing using the usb stick made with the media creation tool I ended up on Windows 10 Home. I just plugged the license key you listed above in the screen that comes up when you choose to change the product key. After a brief install and a reboot I had Windows 10 Professional. When I logged in Windows showed it was unable to activate. A couple minutes later I looked again and it said it was activated with a digital license linked to my Microsoft account. Thank you so much for this article. I was in exactly the same situation, with aggravation from Microsoft wanting to charge me 99 bucks for a pro upgrade when I already had the rights to pro. God, I was pissed today after talking to a Microsoft rep and being told no for a gratis key to pro. I immediately turned my anger into intensive internet research on the problem. That’s when I found your excellent article. It gave me relief at last! Is there a way to create W10 Home media from a PC running 10 Pro? 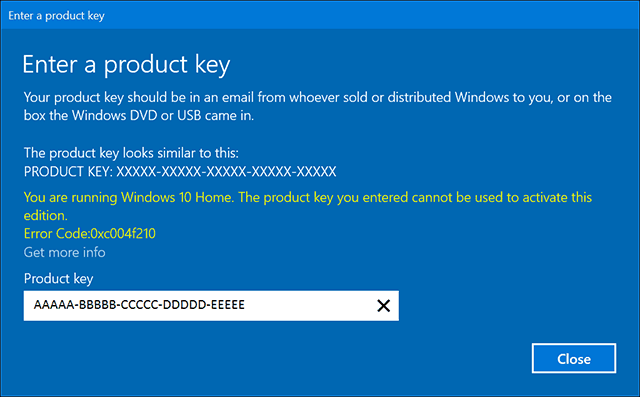 Does this work if your pc came with Win 10 Home and you have a Win 10 Pro product key? My informed guess is that it will. I mean, I used a Win 8 pro key to activate after using the diagnostic key, I’m sure a valid Win10 pro key would be even more likely to work. I say take the bull by the horns and go for it! Worth noting if you use an earlier restore point after doing this, it will restore back to Home Edition – but still great article that was a life saver, thanks. I am not expert in OS, but rather in the industrial art application. I have machine,which is not connected and never again will be connected to Internet, because I lost too much work before to some kind of malware. I found, that I need to upgrade Win 10 home64 bit to win 10 Pro 64 bit. And, obviously I want to do it off line. I know,the upgrade should cost about 100 USD, which I am willing to pay.No problem.But I need to have clean procedure on how to proceed. Can you help?